The Cover Of The Middle school Version Of “Marley A Dog Like No Other”. Anybody heard of “Marley The Dog” before? Well he’s a rather famous dog. First a book, then a movie. But before the book or the Major Motion Picture of him–there was Marley himself, in the “fur” so to speak. From the way John Grogan (who was also Marley’s owner) describes him, Marley truly was a dog like no other. With an appetite for nearly anything he can get his mouth around, including couches and fine jewelry, Marley is always getting into trouble. But to his family, he is a dog like no other. 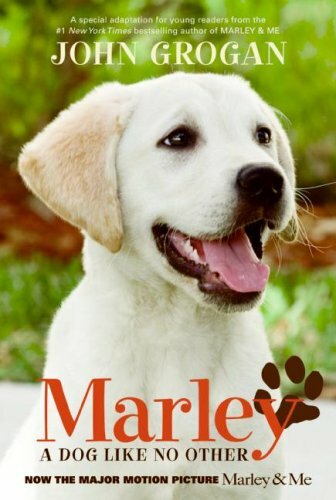 In this adaption of his #1 New York Times bestselling Marley & Me, John Grogan brings the Labrador retriever’s heartwarming antics to life–and shows how one big, rambunctious dog can teach a family what really matters in life. I say the movie, and this book is on my tbr list. Sounds like you enjoyed it. What is a tbr list?